The day before Kintan Brahmbhatt’s 10th birthday, he stayed up late, gripped with excitement, so he could open his presents. After tearing off the wrapping on one package, he was overjoyed to find a bright red, remote-controlled toy car inside. Brahmbhatt placed the car on the floor. With a smile on his face, he inched the joystick forward. The race car didn’t move. As it turned out, the toy didn’t come with batteries, nor were there any in the house. At that hour, there was no way to get them. Where Brahmbhatt lived, there were no stores open late. Deflated and disappointed, he went to bed. This was Brahmbhatt’s earliest brush with what he calls friction — anything that gets in the way of a customer and a task. Put another way, it’s any obstacle that prevents a user from trying or using a product or service. Since the failed spin on the race car, Brahmbhatt’s built a career based on taking friction out of technology, often in remarkably innovative ways. 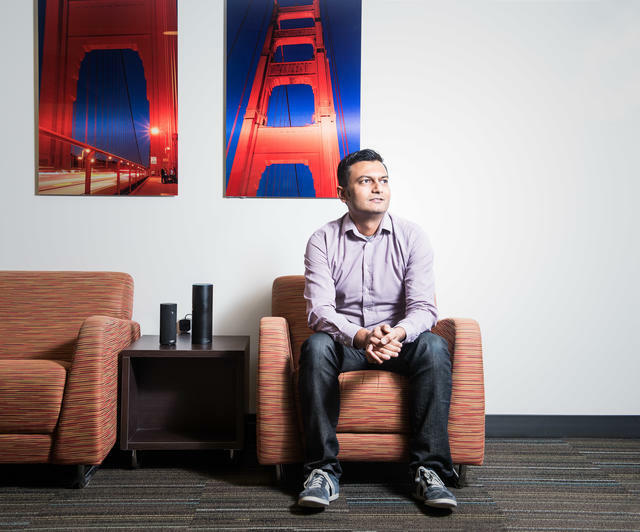 At Amazon, he’s helped develop and define the product strategy behind Amazon Music subscription services and music on Alexa, the voice-recognition technology behind the company’s smart speaker, Echo. He also previously headed the company’s IMDb Everywhere initiative, which produced the “X-Ray” feature that automatically clues viewers into the names of the actors in any given scene. Before that, he helped build what became Skype for Business at Microsoft. Despite best efforts to anticipate and address friction, know that there will be times you don’t find out about a point of friction until it’s too late for a customer. In Brahmbhatt’s early days working on digital medical records project Securamed, an early user traveled to Mexico on vacation and found herself in need of medical attention. Unfortunately, Securamed stored records in English only, and her Spanish-speaking doctor was unable to use them. It was an example of unintentional friction — which you frequently see in new products. The team later added multi-lingual capabilities, and use of the product climbed as a SARS outbreak hit Asia. When building products, you’re always either removing, adding or masking friction. Indifference generates the highest friction for new products. Always migrate your audience to the path of least resistance. How many decisions are between a customer and completing a task? Are each of these decisions absolutely necessary? If so, can you make the decision for the customer by pre-selecting an option? If not, and the customer absolutely needs to make that decision, how can you simplify the decision process? If there are multiple decisions, could you combine them into one decision? Can you present the most important decision first to the customer? How can you preserve the decision once it’s been made so that you don’t have to ask the customer again in the future? Friction is unavoidable in some cases. “If there’s just no way to avoid it, mask it. When we launched AutoRip, the app would take a few seconds to load the large music collection for customers who had purchased thousands of songs in the past. While it loaded, instead of showing a simple progress bar or a spinner, we masked that moment of pause by greeting the customer with a useful welcome message to explain the service,” Brahmbhatt says. Add friction to create a sense of ownership — carefully. The goal isn’t for the user to do a task, but to do it in the most satisfying way. Friction can be a powerful deterrent between a customer and your product. It’s typically introduced by a lack of familiarity or misalignment with human behavior. Start to combat it by mapping the three stages of friction: before the first contact, the signup process — during which you want the customer to complete one task — and the first moment of delight. Then set up listening posts for observing your customers and teasing counterintuitive insights out of the data to discover where friction is occurring. Finally, cut friction by reducing customer anxiety, cutting avoidable steps and preventing context switching.